Australian PM John Howard has warned that irrigation of much of the nation's farmland will be banned unless there is heavy rainfall in the next month. 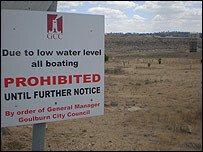 Mr Howard said there would only be enough water in the huge Murray-Darling river system for drinking purposes. He acknowledged that this would have a "potentially devastating" impact on many horticultural, crop and dairy industries around the river basin. But he said there was no choice, and he described the situation as "grim". Irrigators are already warning that if they cannot water their land, there will be huge crop losses and Australian consumers will face large price rises. Australia is suffering from its worst drought on record, and the lack of rainfall has already severely reduced the production of major irrigated crops in the Murray-Darling river basin. The basin, which covers an area the size of France and Spain combined, accounts for 41% of Australian agriculture and usually provides about 85% of the nation's irrigation supply. "If it doesn't rain in sufficient volume over the next six to eight weeks, there will be no water allocations for irrigation purposes in the basin" until May 2008, Mr Howard told reporters in Canberra. There would be water only for "critical urban supplies" and farmers' own domestic use, he said. "It is a grim situation, and there is no point in pretending to Australia otherwise," he said. "We must all hope and pray there is rain." Mr Howard acknowledged that banning irrigation for crops and livestock in the Murray-Darling basin would have a "critical" impact on many industries in the area. Farmers are warning that Australians could face major food price rises if no water is allocated to irrigators in the Murray-Darling Basin. National Farmers' Federation head Ben Fargher said that thousands of farmers could lose their citrus, almond and olives trees if they cannot be watered this year. "If those ... trees do die, then it takes a number of years to recover - maybe five to six years of lost production," he told ABC radio. Australia may not have a rice crop at all this season if it gets no irrigation allocations, Laurie Arthur, president of the Ricegrowers Association, told Reuters news agency. "If it stays dry there will potentially be catastrophic losses," he said. Australia's wine grape production and the farming of stone fruits is also likely to be affected. Mr Howard's government is anxious to tackle the country's drought - which is now in its sixth year. In January, he announced a A$10bn ($7bn) package to tackle the country's water problems, including a plan to overhaul irrigation pipes along the Murray-Darling river system. He also introduced plans for the federal government to assume regulatory control of the river system from the four states that currently administer irrigation rights. All states but one - Victoria - have so far agreed to the plan. Water scarcity is likely to be a key issue in Australia's elections later this year.